So happy for the weekend friends! We are headed to Dallas tomorrow! I have an audit and my husband has a conference there next week. It’s so nice to be in the same city when we have to travel for work! I have so many items on my bucket list while we are in Dallas! Any recommendations for dinner or some cute boutiques? I wanted to share one of my favorite casual looks for summer! 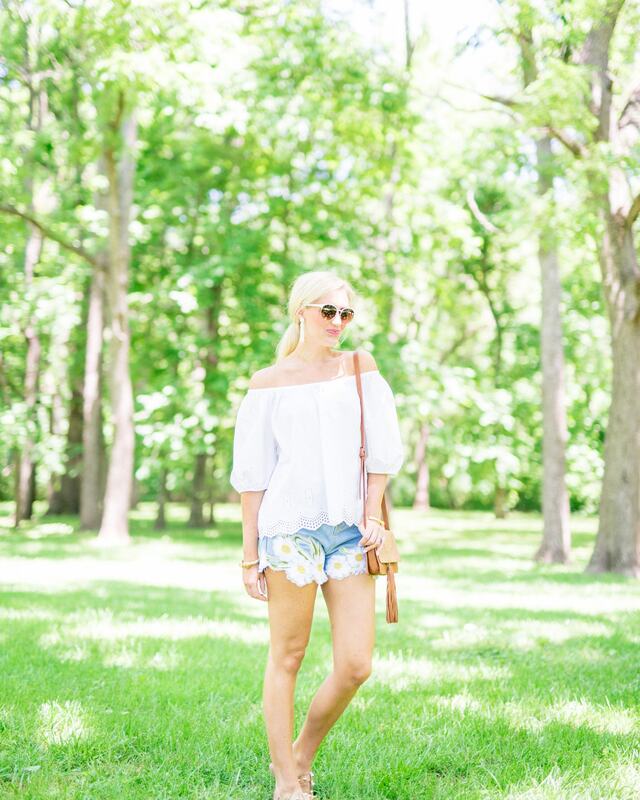 These embroidered daisy shorts are the cutest and are only $16. They also come in white and a darker denim. In the reviews on SheIn’s website, customers have said they run large. However, I thought they ran very small. I am wearing a size XL, and I normally wear a size 6. I paired these shorts with a simple white eyelet top and some cognac accessories. These shoes from Callisto of California have gold hammered studs and glisten like a disco ball in the light! They are so comfy and run true to size. Green Monday Sales & Louis Vuitton Gifting!